Before basements, men had garages as their go-to get away space. These spaces are making their way back into the spotlight with transformations that make them into functional and fun places to be. Mixing form with function, you can create tailored work spaces and complete play spaces. The garage is often one of the forgotten spaces in a home—but it doesn’t have to be. From simple changes that maximize space and function to all-out personalized spaces, your garage is a man cave waiting to happen. 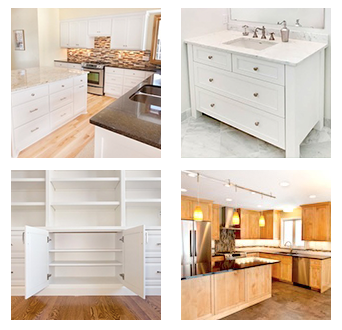 Start with custom cabinets to create storage and function, and then layer in elements such furniture, games and electronics to create your new hangout. 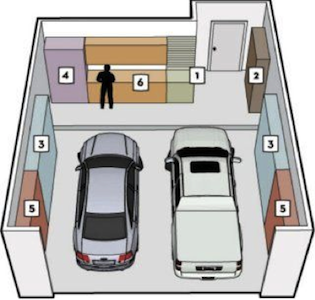 Garages can offer loads of space if organized right. For example, consider this zone layout to help plan the space for easy access to everything you need and create space to hang out. Once you see the potential in your garage, you can tailor each zone with storage and functional solutions that meet your needs. Cupboards and shelving create spaces for organizing and hiding away items while counters and benches provide open work spaces. Don’t forget to consider electrical needs for plugging in tools and electronics! What you see below and above you in your man cave also makes a difference. Garage floors have come a long way from boring cement. One easy and popular option is to seal cement floors with epoxy paint, which comes in a wide range of colors. In addition to giving the space a fresh look, these paints provide a waterproof surface that is durable and easy to clean. Other options include custom flooring such as tile. Garage ceilings provide the opportunity to complete the space with storage, feature lighting and more. Share Your Garage Tips and Ideas With Us! 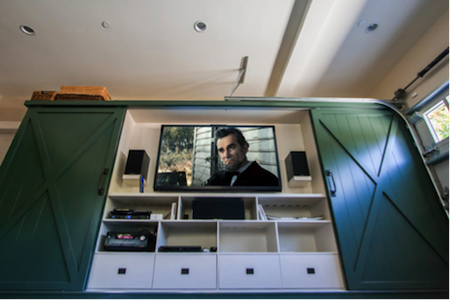 Have you transformed your garage into a man cave or more usable space? Tell us about it! Leave a comment here, share your pics with us on our Facebook page or send us a message on Pinterest. Feel free to also send us an email or give us a call! You can reach us at 952-737-7088.